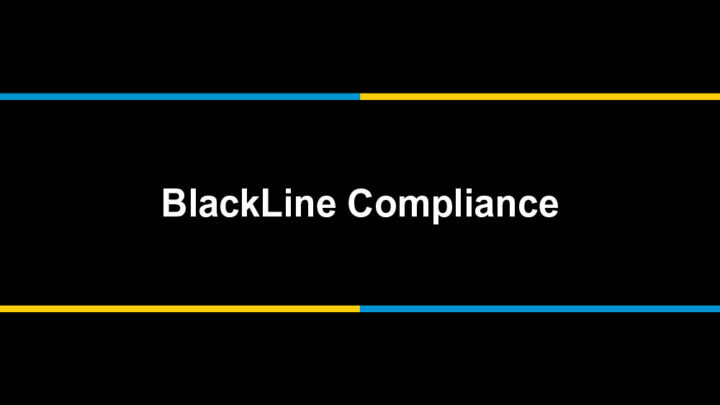 We’re excited to announce our new product, BlackLine Compliance—a solution that delivers efficiency and trusted insight into your compliance program. On Wednesday, November 14th at InTheBlack 2018, we unveiled the newest addition to our finance automation cloud platform: BlackLine Compliance. The solution focuses on streamlining internal control management for both the business and compliance and internal audit teams. Now, organizations can better connect control performance with control evaluation. Under our unified platform, Compliance and Internal Audit can directly access completed reconciliations and other tasks performed in BlackLine. With so many intertwined systems, processes, and people, it’s no wonder compliance and internal audit teams juggle multiple versions of the truth. Risk Control Matrices (RCMs), audit logs, and control testing often live on individuals’ desktops and disparate share drives. Status, testing workflow and results, and issues are communicated through email and word-of-mouth. As a result, the business and Compliance and Internal Audit face challenges coordinating control-related activity and communicating feedback. In addition to creating excess back-and-forth, these inefficiencies can result in errors or delays that could give way to audit findings, penalties, or even damaged reputation. For management, this simply won’t do. Compliance departments need simplification, standardization, and automation so that they can focus on effective risk management, monitoring, and issue resolution. That’s why we built Compliance—a centralized and intelligent solution for managing risk and controls. Compliance is made up of four main libraries: Risks, Controls, Issues, and File Cabinet. The information in these libraries essentially make up the RCM. With everything in the same system, users can link controls and issues identified to their associated risks and vice versa. Users can also specify master records so that changes made at the master level update across child records—ensuring version control across narratives, locations, and audit programs. Next, users can create compliance projects in one centralized location for added visibility and efficiency. Programs in Compliance support any initiative, including sections 302 and 404 of the Sarbanes-Oxley Act (SOX), IT audits, operational audits, self-assessments, and more. Users can add relevant controls and apply workflows within a Program. In addition, control testing templates can be added directly in BlackLine through the Integrated Spreadsheets feature. As individuals complete test steps, they can check them off directly on the Program-level control, add notes, link to or attach evidence, certify the control, and indicate that it is ready for review. Furthermore, management can see and monitor all risk and control-related activity through powerful, highly customizable reports. For example, management can view a high-level risk heat map. They can then drill into details to view high-risk processes, mitigating controls, or open issues. The outcome of BlackLine Compliance is reduced, or rather changed workload on compliance teams. Bringing all risk and control-related activity into one integrated system eliminates manual effort and results in greater alignment between the performance and testing of controls. Compliance and Internal Audit now have direct access to control evidence, which greatly reduces time spent preparing and following up on PBC requests. Rather than being bogged down with administrative work, compliance departments can focus on value-adding activity, such as gap analysis, deficiency trending, and process improvements. They can also be a better partner to the business. Streamlined and clean audits result in consistent and reliable audits and financial statements. In addition, accurate reports enable better business decisions. Management also gets increased peace of mind with visibility into status, issues, corrective actions, and ownership. BlackLine Compliance delivers streamlined risk management and global control integrity for stakeholders across Accounting and Finance, and Compliance and Internal Audit. Join us for a webinar on Thursday, December 6th at 8 am PT / 11 am ET to learn more about BlackLine Compliance. See a live demo of the product and learn about various use cases. Register today. Previous story Live From InTheBlack 2018: Designing Software. Building Trust.